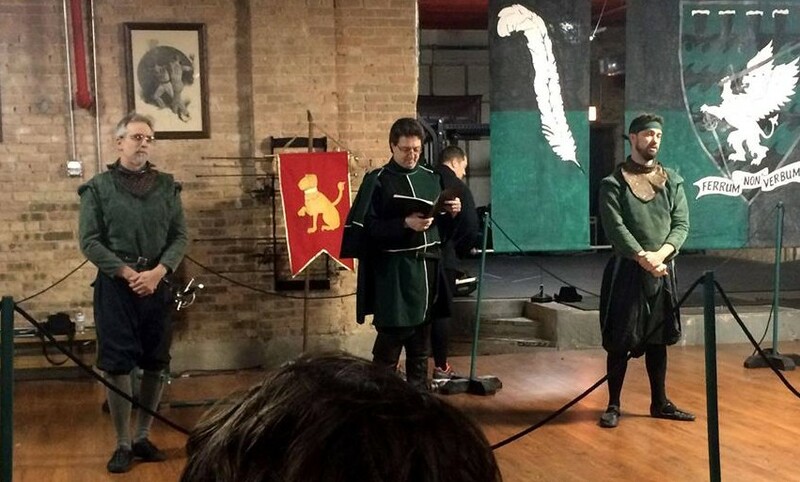 This past weekend, the Guild held a scholar’s prize in both longsword and rapier. 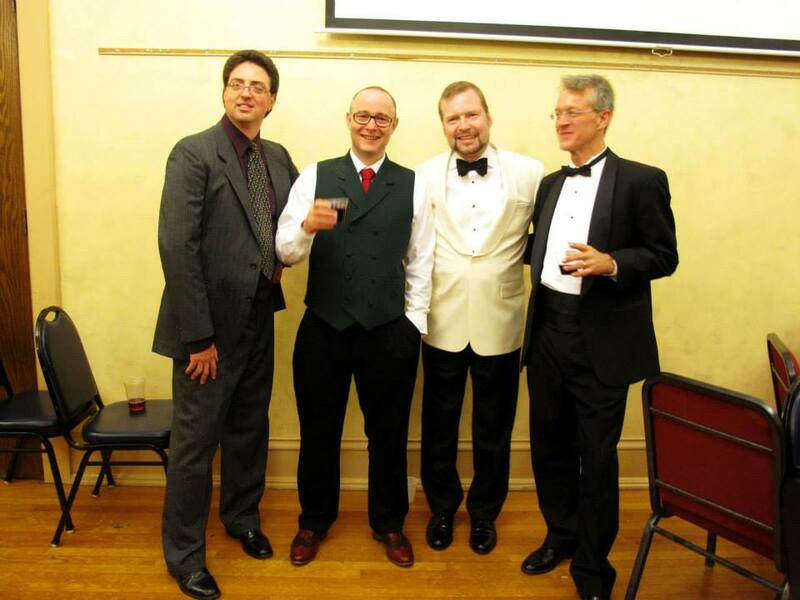 We are pleased to admit Andrew White, Vlad Hintaut and Robert Salud as new Scholars. You can see their bouts here. 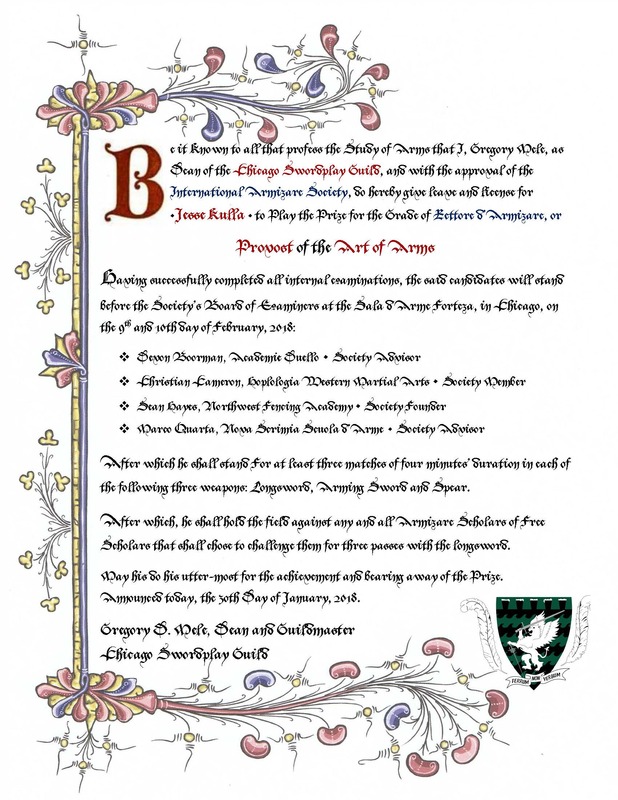 A right of passage in the Guild, we are often asked what a Prize is and how it works. Free Scholar, Jesse Kulla provides a great, insider’s look at how the CSG uses Prize-Playing. New Article on CSG/Forteza in Polygon Magazine! Recently, a reporter from Polygon Magazine was “embedded” in one of our Taste of the Knightly Arts classes. Read his report on Armizare and how teach it here. 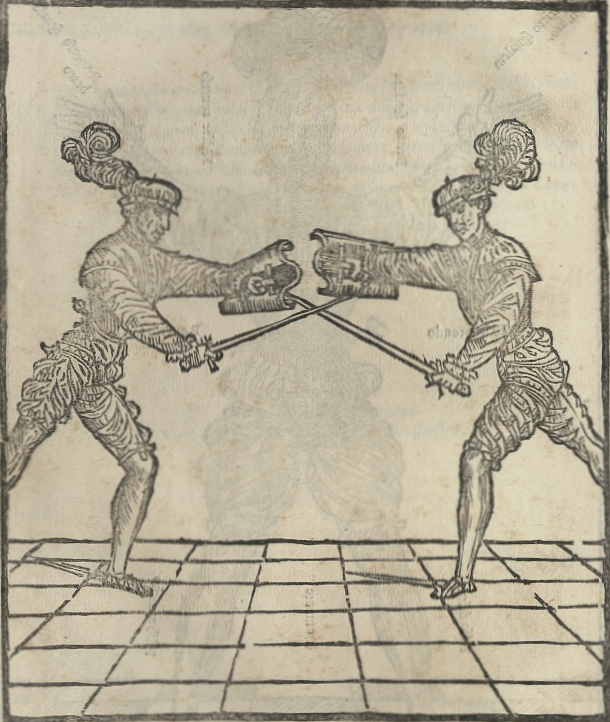 In Lo Schermo (c. 1550, published 1575) Angelo Viggiani dal Montone defines three “advantages”, the Guard, Step and Strike, as the most basic means to gain a more favorable position over your opponent. Viggiani, and his contemporaries, though their reasons differ, prefer the thrust to the cut. As a result, guards that naturally delivered a thrust were also preferred. Thus, the importance of placing oneself in a guard with the point in presence – a guardia perfetta – while denying the same to the opponent is defined as the Advantage of the Guard. Viggiani gives us three methods to gain and maintain the Advantage of the Guard. The first is to make half cuts in order to displace your opponent’s blade while keeping your own in presence. The second is to make feints, or sfalsata, in order to thwart your opponent’s attempts at gaining the centerline in the same way. The third is to step offline to reposition the center more favorably to your advantage. The last method of gaining the Advantage of the Guard should also be understood alongside the second advantage, the Advantage of the Step, which is to place the non-dominant foot (the left foot for us righties) in a position that enables a long and powerful extension of the dominant foot during the attack. Viggiani states this happens when the rear foot is gathered forward to the front foot. With the understanding that stepping offline is a method of gaining Advantage of the Guard, however; one could satisfy both action in a single step. By taking a step with one’s rear foot both offline and somewhat forward, one can reposition the center in his favor while also gaining Advantage of the Step. If you step into measure while you have Advantage of the Step, you also have Advantage of the Strike. This final advantage is the ability to launch an attack in a single tempo. If you have already established the first two advantages, while also stepping into measure with the rear foot, then a single step on the dominant foot can be made to bring the body and sword forward safely. The three advantages are Viggiani’s general guidelines on how to proceed safely against an opponent. But any proactive motion takes time, and while one attempts to make a motion — a tempo — to gain one of the advantages, that tempo can be exploited by his opponent. Viggani tells us that each of these advantages can actually become disadvantages if the opponent decides to act within the tempi of each action. Here’s how it works. Gaining any Advantage requires one to make a tempo. Delivering a half cut requires one to move from one guard to another, falsing requires the point to leave presence, and stepping offline requires the entire body to move. Each one of these movements (and especially any combination of them) is a perfect opportunity for the opponent to strike. Because the one attempting to gain the advantage is required to leave the safety of his guard and move into another, he is momentarily susceptible to an attack, which is what an opponent should look for when making a strike. You parry the attack of your opponent. An attack at you traverses outside of your presence. Your opponent raises his sword to attack you. Your opponent injudiciously changes guard, before he settles in the new guard. Your opponent, standing still in guard, raises or moves his foot to change his pace or to move towards you. Of these, the best time to attack your opponent is when he moves (gives you a tempo). Conversely, a fencer should expect to be attacked if he makes one of these five actions. However, to gain the advantages, one must first move. The advantages come with their liabilities, and may not seem like advantages at all if they are also perfect opportunities for the opponent to strike. The key, however, is that one should expect to be struck at while moving to take advantage. Thus, they are invitations for an opponent to strike. By making a half cut to gain the Advantage of Guard, and a half step to gain the Advantage of the Step, one can entice his opponent to make a full blow, and this large tempo can be exploited in turn with a parry and counter in a single, shorter tempo. In Lo Schermo, which is written as a dialogue, Viggiani is asked by the hypothetical student why it is not prudent to be the first to attack, knowing that the defender will be forced to deal with the oncoming blow. His response is that this would be true if it were not for the fact that a parry can be made in a single tempo; by using a counterattack a fencer can parry and strike in the very moment the first mover meant to land his blow. However, to make a parry succeed in both diverting the blow and striking in a single tempo, one needs to note when and where that blow is meant to be delivered. Rather than simply striking to force a response, seeking to gain the Advantages puts the fencer in a stronger mechanical and tactical position with both sword and body by closing and opening the lines of his choosing, thereby limiting where he can be struck. For example, if the fencer closes the inside line when gaining the Advantage of the Guard, in that instant he is only vulnerable to outside. Having this foresight enables him to reduce his opponent’s decision tree: there is one place he can strike, which means that the fencer only has to worry about closing one open line during the parry, thus dramatically increasing his chance to respond with a single-time parry-counter. With this, we can say that Viggiani’s Three Advantages are also a form of provocation, forcing an attack by our opponent to a specific line in a specific tempo that we will be ready to close and respond to in that instant. The ability to force the actions of the opponent when and where a fencer wants is how you control the initiative in fencing, and control of initiative is at the center of how you excel as a swordsman. It has been a strange week in HEMA-land; at least from my little corner of the world. On the one hand, it has been a great week for getting the word out into the mainstream that there is something called Historical European Martial Arts; on the other, what should have been a fascinating attempt at a deed of arms bridging practitioners of two different martial traditions turned into an unnecessarily violent attempt at a “smackdown” and much of our community has responded to this by showing a profound ignorance of what the event was about, combined with putting the blame almost squarely on the injured party; largely, I suspect, because he’s the outsider. I haven’t been to Longpoint, but colleagues have, and I have had a lot of talks with Ben Michels, one of the organizers, and think that they have tried very, very hard to take their sport and keep it reasonably well-tied to the source art by creating an event where the specialists can compete in their thing (forms, cutting, sparring), just like in most martial arts tournaments, while there is also a more pentathalon approach. Basically, it combines what in Asian martial arts would be completely separate combat sports (kendo, batto, judo, etc) and goes them one better, combining them into an omnibus event that is something like an Olympic pentathlon. 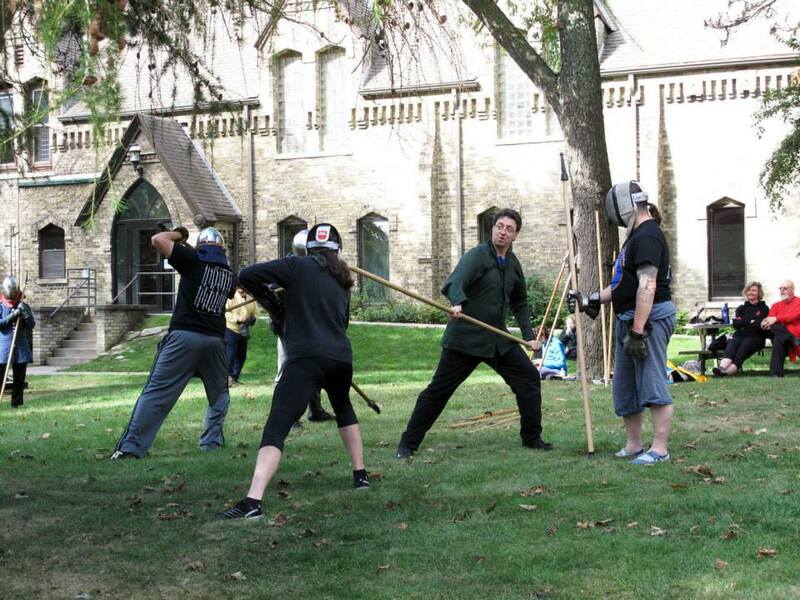 In a nod to the diversity of HEMA, Longpoint even featured demo bouts of areas outside tournament interest, such as armoured combat and Polish saber. c) if you don’t do it my way you are either a lily-livered wimp OR just a sport fencer who wouldn’t know a medieval manuscript from a piece of old toilet paper. b) when you train to compete in a sport, you learn how to train to maximize your performance, which leads to some very effective competition techniques [see Axel Peterson’s victory described in the NYT video slow mo at 3:19] that simply do not show up in historical sources, or are even directly advised against, but make perfectly good sense in a bout where as soon as the hit is made a judge throws a flag and the fight either halts (no need to worry if your fight killed him), or an “after blow” scores and potentially negates the low hit. Thus it is no surprise that this same strategy is common in modern kendo and has a specific name: nuki do, often done dropping to one knee. c) the truth is that some folks both compete and study the holistic art, but we all have to choose where our focus is. If it is competition, then you are going to need to pare down what you do to the weapons and rules that will work best in that environment — you *must* if you wish to be competitive — and if it is the latter, you train broadly and try to adapt what you know to the given ruleset and equipment you are presented with. The problem only comes when you start believing that a tournament is a measure of real combat effectiveness anymore than is doing partnered drills or politely fencing with your mates in the salle. This is as true of is HEMA as it is to mistake boxing or MMA for Combatives and urban defense. So congrats to Jake, Ben and all of the other xKDF folks for landing their 15 min of fame: while we have different focus and interests in the larger HEMA-umbrella, you worked hard, it’s paying off and more people know that there even were historical arts to learn in the first place. Good on you! Sadly, what one hand giveth, the other taketh away. Remember that last point of mistaking what you do for being “real” or indicative of “the way?” Because combat sports are by nature meant to be large, unifying endeavors, they are particularly bad at this, and many practitioners, immersed in their sport’s culture, quickly forget that not all similar activities are meant to be a new take on their sport, and are not done for “competitive” reasons. Persian sources talk about the legendary hero of one thousand man “Hezarmard” a hero who survived one thousand fights. In the same spirit japanese kendo has tachikiri/tachigiri no seigan as a test of courage, endurance and stamina. As a former Kyokushinkai and an admirer of Soke Mas Oyama I have been admiring the one-hundred man fight kyokushin test. Only few blackbelts worldwide have passed the test. Many tried but failed. Everyone who knows fullcontact knows how hard the Kyokushin as a bare knuckle fight is. Although one hundred man fight is very hard and fullcontact its goal is not to destroy the candidate and to knock him out as it is done in the Kyokushinkai world championships or selection tournaments. Moreover one wants to test the courage, stamina, determination and willingness of the candidate. As a researcher I wanted to see how a person can handle that type of fighting with unsharpened training swords and weapons. My team and I trusted Mr. Herbert Heissler, the head of the Czech Stuntsfighter association with choosing the opponents and weapons. You don’t go into a Beasting to win, but to survive. The ‘Beast line’ should be composed of fighter who are your peers or better. Any one of them has the capacity to end your day. The purpose is to push rather than break, after 3 or 4 minutes the initiate is usually exhausted and battered. At this point it’s all about balls and determination. So far so good, and really this should not be considered “weird” to a HEMA person: after all, Playing the Prize; which was how the historical guilds in many countries bestowed rank, and has been used by many modern HEMA schools was just such an event. Although 100 men exceeds the numbers recorded by 16th century Guilds such as the London Masters of Defence, those prizes were also played without any real safety gear besides blunted weapons, and some basic safety rules: no pommel strikes or grapples, no hits below the belt, no thrusts to the face (sometimes no thrusts, period). Likewise, staking out a location for a set time to fight all comers did not originate with the Guilds — it was an aping of a tradition already established by knightly combatants in the 14th century — nor did it end with them; such activities continued with English “stage gladiators” until well into the 18th century was the origin of modern prize fighting. He assured us that all weapons were aluminum besides Fechtfeders which were made of steel. We were assured that they were light Feders as used in longsword championships. My main instructor Mr. Heiko Grosse pointed out to me that I should make sure that they should be flexible enough as our armor was light for steel weapons. I have always admired longsword fighters as they are very technical. We figured my light armor which was meant to absorb the shock of fullcontact aluminium sparring weapons could also do the same with very flexible steel feders. We agreed that the fights would be fullcontact and contnuous. In spite of the fullcontact nature of the bouts, the event was to test my stamina and willingness to fight. We asked couple of times to change the date from Thursday September 11 to a weekend so that both my staff members could accompany me at least and even some other team members from Razmafzar. However we were reassured by Mr. Heissler couple of times that was the only day where all participants including fighters, doctors and organizers could come…. I was relaxed and not nervous but to my surprise I realized that some of the participants were nervous and were speaking loudly to Herbert in Czech. I did not understand anything but I figured they were discussing the rules. I did not care about the rules as my intention was not to score neither count points. My biggest challenge and enemy there were not my opponents as I looked at them as my helpers. My biggest challenge and enemy were my stamina and dehydration. There were a professional surgeon and a medic there who advised that after ten rounds the fights should be stopped as they had to check me and my possible injuries and I had to drink due to the danger of dehydration in armor. That meant stoppage after twenty minutes of continuous fighting. I agreed with them. At this stage I would like to thank both gentlemen for their professionalism and their help during the entire event. Although Dr. Khorasani was polite in his analysis of the fight, he makes it clear that the feders were not the lighter flexible feders he was familiar with, nor where his opponents really trying to “press him”, they were trying to break him. Which they did, with four broken ribs, two cracked ones and several broken fingers, one requiring surgery. Maybe so, and from the video, I would agree about the 8th fight. But it didn’t start that way. I don’t know a single member of Digladior, but I can at least compare the video of the challenge fight with the videos they post of them fighting amongst themselves. As a good example, look at the end of the second fight and the transition into the third. I understand that the rules were “full contact”, by which I would assume that it was meant with sufficient force to deal with an unarmoured foe with sharp blades — no playing tag. Those hits, while fairly typical of many tournament hits for sure, were far harder than necessary to the task. More so, the mad rush to attack Dr. Khorasani by the sword and dagger man, without so much as a salute or even a pause for him to catch his breath, was just coarse and set the tone for the entire fight which was wild and brutal. To be blunt, those weren’t sword cuts, they were stick fighting strikes with a blunt, steel stick. The sixth and seventh fights weren’t much prettier than the third, but at least most opponents offered a salute and moment to catch your breath. I can’t comment on the idea of letting a guy with an axe and shield fight, and I won’t dignify a number of the non-Digladior fights with the term “HEMA”, other than the gentleman with the dussack and buckler, who seemed to the only guy actually trying to use technique and fence, rather than “beat down the foreigner”. Since it happened in Europe, and it was martial (that is what you call it when someone is trying to beat your head in), so maybe we can just call it EM. 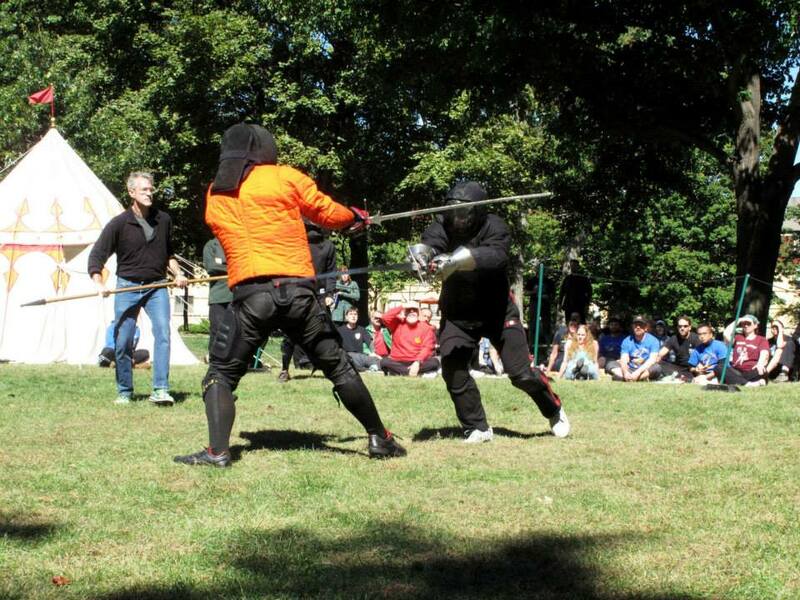 1) This is what happens when a Battle of the Nations guy decides he is going to play in light gear with HEMA people. 2) This is such an embarrassment for our sport, and misses the entire point of why we do this. 3) This is why you have referees calling hits! 1) Dr. Khorasani recently taught some Persian wrestling to a BotN team; he is not a Battle of the Nations fighter. (For those not in the know, Battle of the Nations is another type of “medieval combat sport” — essentially submission fighting with steel weapons in full armour. It is very rough fighting, although as the rules expressly ban thrusting, it negates the principle historical method of combating armour, and consequently most BotN fighters have little interest in the historical arts themselves.) He *does* own a full suit of Persian armour, just as I own two suits of European harness. However, most HEMA folks — especially those focused on tournaments — have no interest in armour or armoured combat and consider it “dress up” or “reenactment”. An odd position for folks studying ‘the knightly art’ perhaps, and not true — there was even an armoured demo at Longpoint — but the larger point here is that the poster clearly didn’t read either the challengers or challenged description of what the event was, and just assumed that Dr. Khorasani must be engaged in “that other sport”, one that has no love lost with the HEMA tournament scene. 2) It can’t be good or bad for “our sport” because a) “HEMA” does not unilaterally equal “tournament fighting”, b) Dr. Khorasani does not study HEMA, and not all of the participants were “HEMA” people, c) wait for it….this was not a sporting event, but a martial arts test, as was made clear from the get-go. Why a man studying Persian martial arts is now responsible for the reputation of HEMA tournament combat is beyond me. 3) Referees defeat the entire purpose of a test of character and endurance. Indeed, part of the reason for referees in competition is an inherent suspicion that the fighters will not be honest in calling blows. Further, many forms of HEMA competition today do indeed have people call their own hits, or at least refuse points for blows they think they improperly landed. This is simply purged from the competitive tournament circuit because it “puts too much pressure on the combatants”. That right there is the difference between a martial art as a test of character and a combat sport as a way to win some sort of trophy. Both are correct in their own place and time, but the post shows a complete ignorance as what this event was. Robert Grene and William Browne shall play against all alyens and strangers beinge borne Without the king’s Dominions in Axe, Pike, Rapyr, Dagger and Rapier and Targait. Which are only two of the many challenge matches fought by members of the London Masters purely as a public test of arms, and have clear analogs throughout the 14th and 16th centuries, throughout Europe. Likewise, I am sure that modern challenges such as Guy Windsor’s two-hour holding of the field at WMAW 2009, or Bob Charrette’s celebration of his 60th birthday by fighting 60 minutes in full harness at WMAW 2013 are just marks of hubris, rather than a personal test? I don’t know that last poster even by name, so I confess that it is a bit unfair to make him a strawman in an argument, but it speaks to what discussion on social medial regarding the 100 Man Fight has really left me feeling appalled by: the length to which the self-referential nature of HEMA Sport fighting has made it impossible for so many students of western sword arts to even “get it” when confronted by something that doesn’t involve referees, flags and points — items that our ancestors would themselves have been largely bewildered by. There is very little in this event for the HEMA tournament organizers to learn from in my opinion, but it does enforce what is already common knowledge. As a singular event there may be something to learn from this — mostly what not to do — and the main point I wish to emphasize is that for a swordsman, or a fencer, it is a requirement to be brave and tough, but doing something like this is not necessary nor is it beneficial for anyone. This should be true to those who were part of it too, as it seems that no one had intended for the event to finish this way. That would be reasonable if only a) this sort of thing had *anything to do with tournament fighting in the first place* — as Dr. Khorasani had stated repeatedly, and as the Digladior report makes clear they also understood, at least in theory, b) what the test was meant to be and what happened are not the same thing — again as made clear, c) these sorts of tests of character already occur in many martial arts, and indeed in HEMA groups — almost any that use Prize Playing. there is no glory in getting bruised by a sword. There is some, but very little being tough. Each one of those bruises probably stands for a lost limb and a fatal injury. Also there already exists decades of testing of protective equipment, and riot vests and hockey gloves have been seen as inadequate years ago. It saddens me too someone walk the path of broken fingers just because of ignorance. While I agree with the statement in general, I would point out this is comment is somewhat disingenuous as the specialty HEMA gloves worn by tournament fighters did not stop not one, not two, not three, but four broken fingers at WMAW, one of our own members from getting a broken hand in the tournament at CombatCon, and on-going complaints after every tournament about broken fingers or hands. Further, as Dr. Khorasani states, he went there expecting to use aluminum swords and light feders, and that is not what he was greeted with. Events like the Dog Brother Beastings demonstrate quite clearly that one can fight in very, very little gear very hard and not get overly injured if everyone understands what they are trying to do. I would really like to write the challengers a pass and say that they didn’t understand, their own words state that they knew why they were there. These things have been discussed before, but the notion of full-contact swordfighting is strange. Due to the paradoxically impotent but dangerous nature of the blunt weapons leads to an emphasis in effectiveness of unarmed close quarters techniques and at times overly hard hits with the weapon. The latter is due to the need to get physical effect on the opponent with the weapon that is essentially deprived of its capability of causing this effect: the sharp bits. In the video the fights were not stopped on hits, which is exactly the things that leads to escalation unless the fighters have a proper mutual understanding and good communication during the fight. Again something that has been established during the years in various tournaments, hence leading to rules where maximally one “after-blow” or follow-up strike after initial hit is allowed. Again, what seems reasonable at first, makes sweeping assumptions about how fencing occurs throughout the HEMA-verse and assumes that tournaments have been designed to address this “problem”. They have not. Not least of which being the one-hit and stop, reset, nature of HEMA tournaments is highly artificial. As a great deal of forensics data, not to mention historical accounts of swordfights and the advice of the masters themselves, unless the head or hands come off, very little in a swordfight is guaranteed to be an instant fight-ender. Having a judge call HALT does not simulate this in any way — nor was it thought to do so historically; the “afterblow” as used in modern tournaments is entirely anachronistic from its use in the 16th century fencing Guilds and is at best based on a very liberal read of a very short passage on fencing competitions by the Bolognese swordsman Antonio Manciolino. Indeed, German Fechtshule seemed to have been much more like knightly deeds, consisting of counted blows, where the fight just continued until the set number of blows had been thrown. And a number of them wear additional protection under their jacket or trouser. The end result of heavy kit is that people aren’t terribly afraid of getting hit and throw themselves into fights. Anyone who wants to say that HEMA tournaments avoid “full contact hitting” because it really isn’t necessary to hit that hard with a sharp weapon (a point on which I agree), or that allowing takedowns on a hard surface is unusual just need watch the messer finals from Longpoint to see that clubbing-masquerading-as-swordsmanship is hardly something that was invented for the 100 Man Fight. The idea of calling a halt at each hit ignores that continuous, flowing fights is common in many schools, particularly during Prize Playing, and yet injuries, escalation and other problems are rare. Why? Because the challengers aren’t there to win, only to give a good, clean fight. But as this sort of engagement is not a part of his own sparring culture, nor does he have any background in martial arts that have these sorts of initiatic challenges, he assumes it cannot be done and that a style of combat sport that has been invented over the last decade must provide the one, true, working model for testing oneself with swords. Likewise, if a full contact armored fighter wants to study – or compete in – a historical sword art simulating unarmored duel with sharp swords, he has to somewhat adjust his mentality and equipment. And it should not require anyone getting beaten half-dead to realize the above. There is an assumption that Dr. Khorasani was a BotN fighter, when a simple read of his webpage and watching his videos (also at least one of the posters was just at a seminar with the man), would make it clear that what he meant by full-contact, and that the gear he stated he would fight with is what he does most of his bouting in. You don’t have to know the man at all, you just need to go to Youtube. Persian Martial Arts are just like their European counterparts of the period — meant to be used in and out of armour, and originally developed for warfare. The fact that so many modern HEMA people want to study a 15th c art while ignoring a major part of the context, does not mean those who do differently are engaged in “crash and bash” fighting. There is a hypocritical contradiction here, where Dr. Khorasani must be a BotN guy looking to duke it out in heavy gear, but then he is held to task for being the guy too lightly armed and armoured. Now, whether or not he should have trusted the organizer to communicate this is another matter, but then again so is the question of why his opponents felt a need to come after him with kicks thrown while wearing plate armour, an axe or throwing blows that frankly were way harder than necessary for a friendly challenge, particularly one where there was nothing to win. No one was “beaten half-dead” — although the injuries are far more than they should have been, broken fingers and hands are quite common in HEMA circles, and broken ribs, etc not terribly uncommon in many other martial arts. The fact that one poster feels “the reason we fight with swords is because we don’t particularly like black eyes” may be true for him, but has little to do with martial arts in general. Nor was the intention to try and prevent being “beaten half dead”. As stated clearly: In the same spirit japanese kendo has tachikiri/tachigiri no seigan as a test of courage, endurance and stamina. What he got was a group of more heavily geared guys who, whatever their claims, were quite clearly batting for the fences. This was not a tournament, it was not meant to inspire tournaments. Dr. Khorasani wished to test himself in a type of deed of arms that is part and parcel of both our historical, European tradition, and his Persian one, and which has been part and parcel of a number of armed and unarmed combat arts, as already stated. This was a personal test, and the challengers are meant to push and test, not try to crush — which is far too easy to do as they are fresh and the challenged grows progressively wearier. Nor was it a HEMA event. If one of us wished to do this — as has been done in a variety of ways — it would be quite simple; there are now HEMA events all over the world. Dr. Khorasani and his small team represent the sum total of Persian swordplay researchers. So, rightly or wrongly, he trusted someone he knew to help him arrange such a test vis a vis the help of swordsmen he felt shared a similar interest in reconstructing their traditional martial arts. I would assume he came that conclusion based on the HEMA events in Italy, Malta and Germany he had participated in. He was clearly wrong. I want to be very clear. I think Dr. Khorasani was ill-advised to do this. The reason is that all of these other challenges, from Guild Prize Playings to Dog Brother beat-downs, occur “in house” — within one’s tradition, with fellows on the same path. Because he does not have other folks in his tradition to do this, he of necessity had to go outside his tradition. But in that case, he would have been better-served working more closely with a group of HEMA folks he knew well, perhaps at one of their events, where he could have had more control over the events. When the organizer would not move the date, and it was clear that the standards of weapons and gear were wildly different, it was late in the game to back out. I also look at the recommendations made by both Khorasani and Digladior for moving forward and agree that the matches should have been shorter (a set number of blows, IMO), the exact specific gear noted and required and mass weapons banned on less the fighting was to be done in armour. Those things were poor choices on everyone’s part. I fully expect and accept that as HEMA has grown, specialization has occurred, not just by art, by what aspects of that art to practice and in what environment. We can agree or disagree on various points as to the virtues and flaws of our particular approaches, we can even agree to disagree. What we cannot do as serious researchers, teachers and students of HISTORICAL EUROPEAN MARTIAL ARTS is to ignore these differences, or insist that it is impossible or undesirable to move from one modality to another. Doing so already destroyed the diversity of fencing, and exterminated the first HEMA Renaissance in the early 20th century, in the push for standardized rules and focusing on referred competition as the “measure of the man” comes the real problem of dismissing any who are interested in something different as aberrant; it also rapidly removes us from the martial ethos of our ancestors, and makes this the pursuit of creating just another contact sport like rugby or football. I wish Dr. Khorasani the very best in his recovery and hope the 100 Man quest will someday see light again, just more carefully planned, with folks who get its purpose and in an environment that will be respective of what all deeds of arms in chivalric cultures were meant to do — to assert one’s willingness to put themselves out on the line and test themselves in public to their utmost. 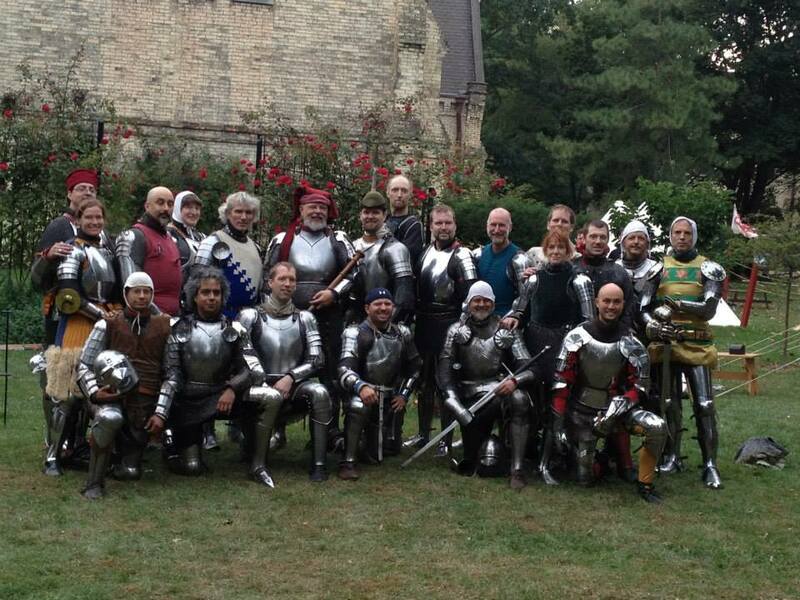 Please note that the Dekoeven School of Arms event has moved two weeks earlier to September 5 – 7, 2014. Watch this space for event details! The Dulelists at Dawn. A few were surprised to find out that we really meant dawn…. Whew! As is a decade-old tradition, eight days after it began, Sean Hayes was the last to board the plane, officially turning out the lights and locking the door on the Western Martial Arts Workshop. 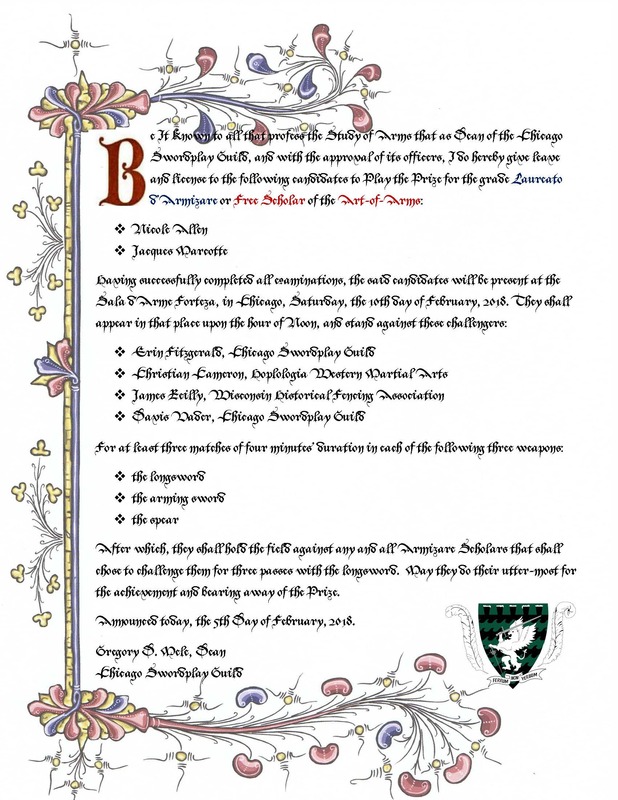 WMAW 2013 was our most packed event ever, not just in terms of classes, but with an armoured Deed of Arms (actually, a Deed within a Deed – more on that later), an on-going Challenge Tournament, an early-morning Duel at Dawn and more lectures than we have ever had before. Based on early feedback, I think it all worked, or mostly worked, but the downside was that many of the special events required special planning meetings on site, so as part of the event staff, I saw less of the actual classes than I normally do. We try to change out about 1/5 of the instructor roster each WMAW, bringing in new folks from both the US and abroad. This year our new faces included Tim Rivera (Esgrima Comun, USA), Roger Norling (All-Meyer-All-the-Time, Sweden), Mishael Lopes Cordoza (German longsword, Holland) and Roberto Laura (Traditional Italian Stick and Knife, Germany). Despite by best efforts, it proved impossible for me to get to Tim’s Spada e Rodella (sword and round shield) class, although it received rave reviews from my students, as did Lopes’ Dutch dagger fighting class, which one my students dubbed: just like Fiore, only meaner and more vindictive. Fortunately, I *was* able to take most of Lopes’ longsword cutting patterns class and to audit Roger’s short staff class. Neither disappointed. “Techno-Viking” moniker aside, Lopes is an articulate instructor with fantastic body-mechanics who was able to relate why the patterns he was teaching were not just mechanically efficient, but tactically preferable in terms of tempo and line. It was a great class, even if I got pulled out to go deal with some administrative issues about 2/3 of the way through. Roger Norling and I share a love of polearms, so when I invited him to come, I of course insisted he teach a class on Meyer’s staff. This three hour workshop was a real highlight, not just because I think Meyer has left us a brilliant, elegant and powerful system of staff-fighting, but because Roger’s pedagogy was equally brilliant. Ably assisted by new friend, fellow Illinoisan and brother-at-arms Chris Vanslambrouk of the Meyer Freifechter, from the moment he began his warm-up, everything Roger taught was designed to initiate students in the body mechanics and broad motions of the art. 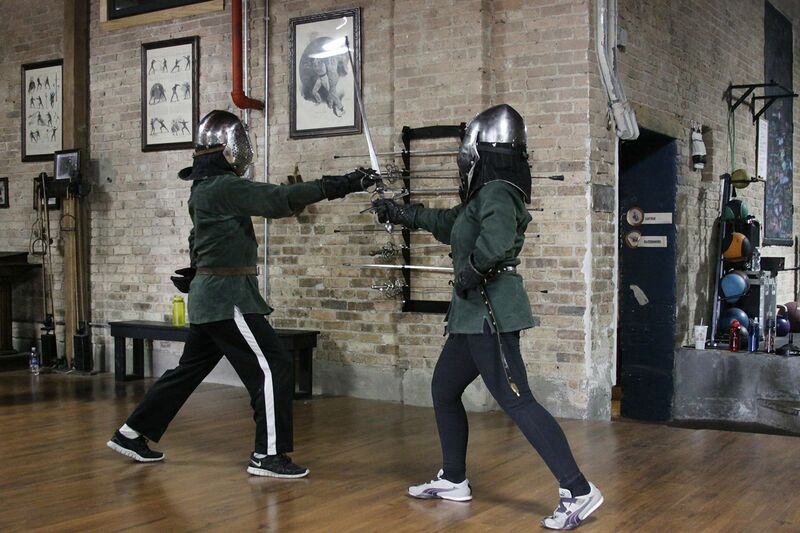 The Gothenburg Historical Fencing Society is known for its physicality and conditioning, and Roger brought this to his teaching: the first hour of the class would have been a fantastic stand-alone class in relating warm-ups and conditioning to your martial arts practice. Fortunately, there was two more hours of solo and paired work and people got a great work out, exposure to an art most of them had never seen before and I suspect an eye-opener as to the power of the humble staff…. Speaking of Jorg, he also taught a brilliant class toward the end of the weekend (what the instructors named “the Graveyard Shift”) called “The Sword Comes from the Messer”, that demonstrated adaptations of messer play to longsword, rather than the other way around. This became was one of tidiest, most concise lessons I have seen, equally useful for experienced practitioners as well as a short immersion course for newcomers to the German tradition. Dr. Les Moore has become synonymous at WMAW with American Catch Wrestling (the colonial inheritor of English Catch-as-Catch Can), and he did not disappoint this year. But he also told me early on that he wanted to focus on beautifully illustrated, but slender self-defense work by Nicholas Petter. I confess I was a bit skeptical – not in Dr. Les, but in whether or not there was enough there for the class he was proposing, but since I hadn’t looked at the text either seriously or in over a decade, I said OK. Apparently, that was a good move! I could. I could tell you my thoughts on the class, but I’ll instead quote Jesscia Finley, herself no stranger to grappling: “I think I am in love with Dr. Les. Holy Crap that was good!” There you have it. Jessica herself taught both a class on how to “spar” with historical wrestling and a 3-hour workshop on the work of Ott and Von Auserwald which also included a significant component on how to actually enter into wrestling: an area that many HEMA folks without prior knowledge of grappling, judo, etc are usually fairly weak. I only got to audit about half of the class, but I loved what I saw and my selfish solution will be to have her here for a private workshop. Roland Warzecha has long been an advocate of slow-motion, free-form training, and this year he refrained from participating in coached fencing to instead teach an evening mini-class in his methods and principles. I cannot express how much the attendees loved this: I was cornered by almost every attendee and told “why can’t we have him do an entire 3-hr workshop on this?” OK, OK, I get it – I’ll talk to Roland… or at least, his alter-ego, The Dimicator. I know there were other classes, and I know a lot of them were great: “Wow, Sons of Hauptgames was even better than the first! 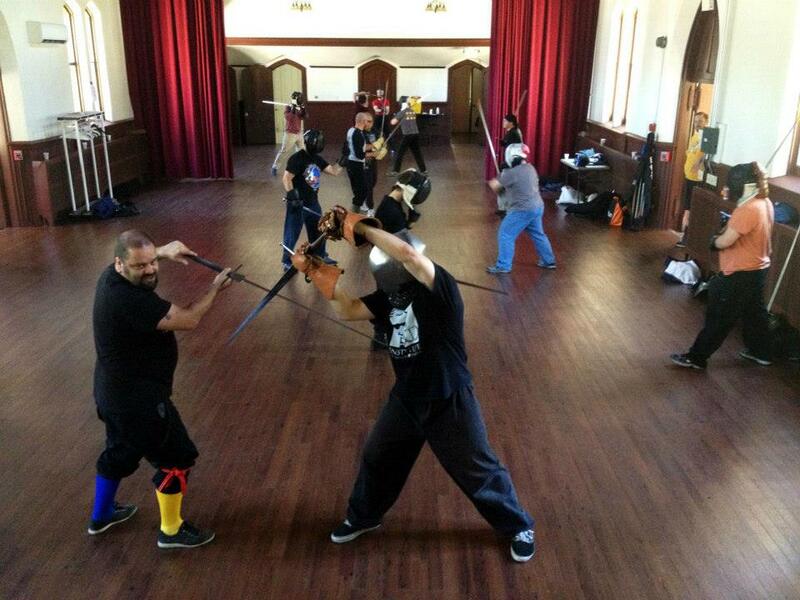 That was a really great rapier mechanics class! The Sneaky Stuff class really was…sneaky.” But I didn’t get to see them. (How *does* one get to be a guest at his own event?) I *did*get to see some of the lectures, from Elizabethan Sea Dogs to Spada da Popolo (the history of the Italian knife arts) and an intriguing lecture by Ben Roberts on the English longsword tradition. Mark Lancaster began the event with a lecture on A Hidden Tradition – a rumination of the “common art” of the Middle Ages which the various masters were improving upon or countering; essentially “what did most combatants know”? It was well-received and Mark is still working on the topic, so hopefully I’ll see version 2.0 someday. That’s gotta hurt! 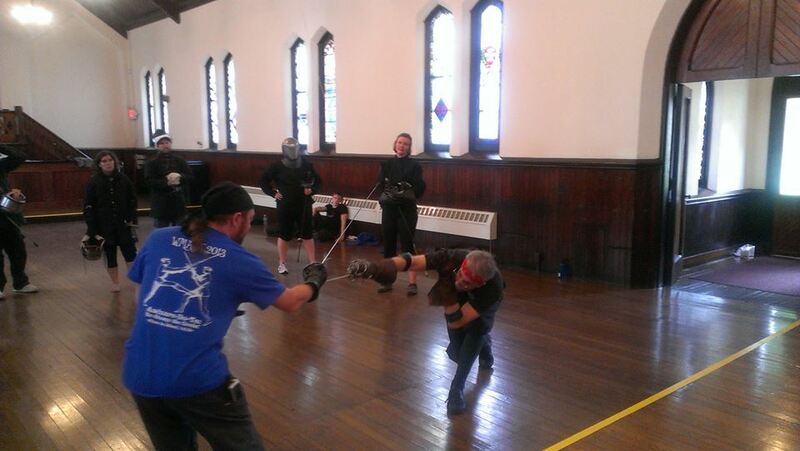 A near-miss by Roland Cooper ends in his beheading by Mishael Lopes Cordoza during the longsword finals. There has long been a great deal of discussion, interest and debate in the virtues and methods of competition in refining and testing martial arts skill, and a strong divide between traditional martial arts and combat sports. In recent years, this same interest, debate and specialization has become a part of the Historical European Martial Arts community, with various sub-communities ascribing different levels of importance, emphasis and virtue to formalized competition. Competition should be a good test of physical skill as well as character; If combatants don’t have a chance to fail both physically and personally in a match, you do not have a martial arts competition, you have a sports competition. The current emphasis on the After Blow in all fights, rather than the original “king of the hill format” has actually encouraged double-hits as people game the After Blow to negate an attack. No one likes to be eliminated in “sudden death”, one-hit fits, but that is the reality of a lethal fight with sharp swords. As Fiore dei Liberi wrote: “in one missed parry lies death”. Most fencing tends to be like vs like weapons, whereas the various masters all assert that their art works in all manners of combat, against all weapons. No set of rules can accurately reflect real combat, only reward realistic tactics and deemphasize unrealistic ones. With these rules in mind, Ben and I conceived the WMAW Challenge Tournament. Here is how it worked. 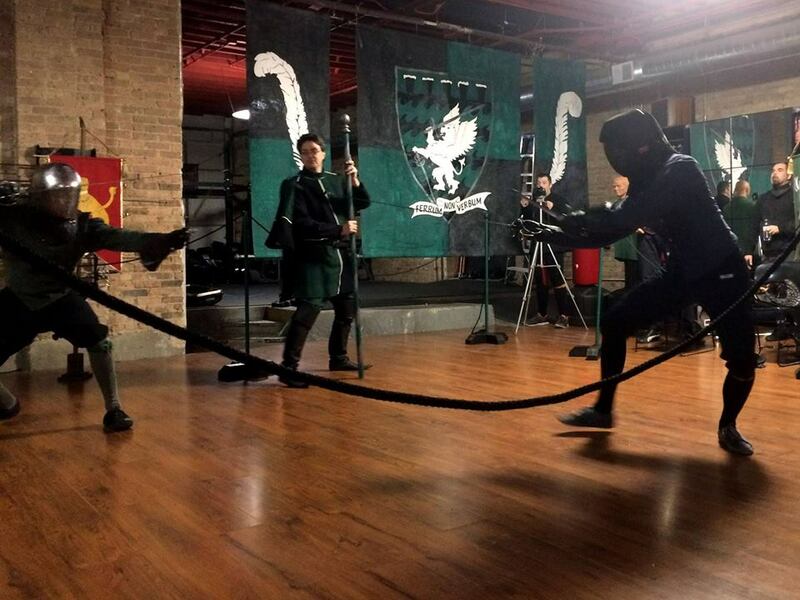 The tournament was fought in two rounds – an open Challenge and invitational Finals. 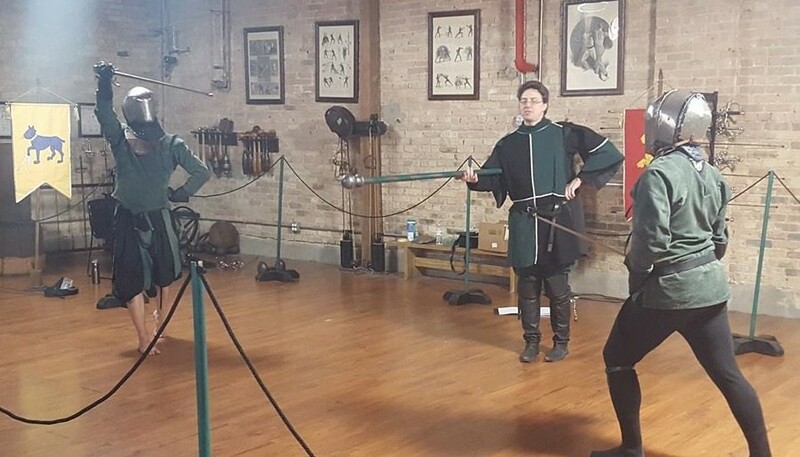 The Challenge Round was open to all attendees with the requisite equipment, began during Thursday night free-fencing and ran all through Friday classes, concluding with Friday night free fencing. Fights were conducted privately and judged on the honor system, based on the stated Scoring Conventions (see below). If there were any double hits during the match, both parties lost 1 pt. Therefore, in any match a combatant could score between 3 and -1 points. These rules were not meant to be “realistic”, simply to prioritize drawing first blood and avoiding double-hits. No matter how many double hits, for the sake of simplicity, only 1 pt was lost. Finally, Combatants could choose to fight in any of the following categories (and could participate in as many as they like): Longsword, Cut and Thrust Sword (inclusive of sword alone, sword and buckler, or sword and dagger), Thrusting Sword (Inclusive of rapier, rapier and dagger, rapier and cloak or smallsword). What defined which category you were fighting in is what you are armed with, not your opponent. 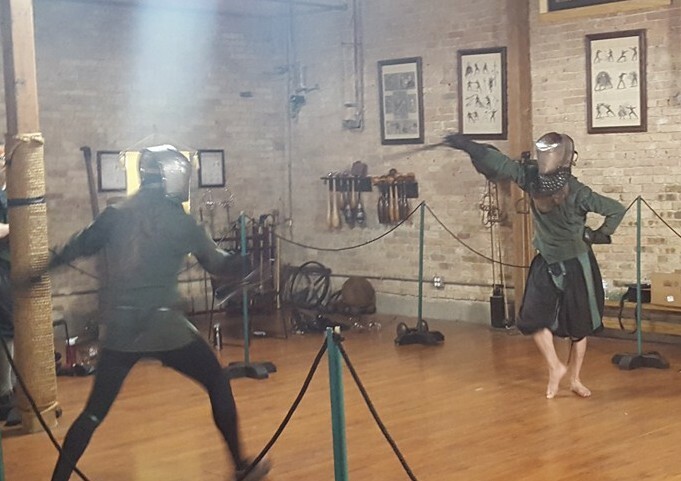 Thus, if two combatants wish to meet in the field with longsword vs. rapier and dagger, they are welcome to do so – with one person receiving a score in the Longsword category and the other in the Thrusting Sword category. Good question! The answer is: parts did and parts didn’t. The scoring conventions and open format of the Challenge round worked very well, not least of which because combatants were sometimes annoyed or frustrated by the results. “What do you mean I got zero points? I WON!” Yes, but you got hit first and double-hit. Look at it this way, your opponent got nothing, too! What was interesting was that in some cases, he who fought most and won most clearly dominated – Lopes had more points in longsword than the second and third place finish combined – at other times the two finalists had not fought that many bouts, but had managed to win, score first blood and avoid double-hits, as happened in the Cut & Thrust round. The honor system worked just fine, but in part because we put in a caveat: if you couldn’t agree on the results of the bout you went to the recorder and were forced to play Rock, Paper, Scissors. The victor in the Rock, Paper, Scissors was to be announced at Saturday’s dinner. Act like a child, get treated like one. The RPS Solution was never invoked. Now, a few people gamed round one – both parties scored poorly and decided not to report their results – and that’s probably no better or worse than any other problem in tournaments, from poor or biased judging to gaming the After Blow. In this case it really didn’t matter, because there was no prize to be won – as we made clear at the start, this was just an experiment to try various scoring and judging conventions with a heterogeneous audience. The major flaw with the tournament was that participation was lighter than anticipated and as I asked people why they weren’t trying their luck, I heard a common refrain, even from those who like to compete: it was hard to move back and forth from a competitive mindset to a free-play mindset, from focusing on trying new things or being highly-technical to relying on “what worked”. I hadn’t really considered that, but in retrospect it makes good sense. I *was* happy to see that a number of folks did try mixed weapons, and that added some diversity and variety to the fighting. At its core, WMAW is a teaching, research and networking event, not a tournament event, of which there are a growing number. I don’t know that we’ll do much with refining the model at WMAW itself, but those lessons will plug in to what we do with our off-year events. I will say that if I were to carry the experiment further forward, I would make phase one of the tournament focused on a single, three-hour evening block, probably advance the top four to the second phase, and perhaps have the two highest-scoring finalists of whatever weapon bout for the overall victory. But it was fun to try and it did reinforce my feeling that if your goal is to use competition as an adjunct to training, rather as a focus for a particular event, the rules can be quite minimalistic, and a lot is gained by not placing all responsibility in the hands of the judges. I look forward to chatting more with Ben, Jake and Sean about refinements in the days to come. In the last few years a reconstruction of an Armoured Deed of Arms has become one part martial exercise, one part extended exhibition match. It is not meant to be a “reenactment” (although I certainly caught a few snickers about that), but rather an homage: if you are going to go the trouble of wearing $3 – 10K of armour and reconstruct armoured combat the best way to pressure test that is the same way as the people who did so originally. My model for this has been the modern jousting movement, where the competitors are in historical kit, using a modernized set of historical rules (generally for safety), with a ground crew in historical kit, but with no pretensions by the competitors or announcers that it is an historical event, anymore than dressage, fox hunt or rodeo riders pretend it is the 19th century, despite wearing a traditional ‘costume’. We must be doing something right, because from a meager handful of guys at the first Deed, there were nearly combatants this year, most in full, homogenous harness! Among the new faces were Christian Cameron, Marc Auger and Dr. Ken Mondschein. 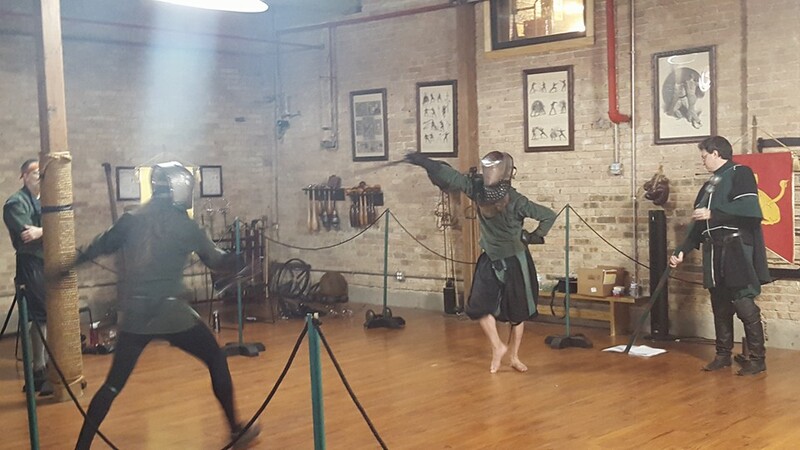 Although I was disappointed with some of this year’s Free Fencing (including the handful of pick-up bouts I managed to get in myself), I think we saw some of our best armoured combat matches, with everything from dagger to poleaxe. Judging of a good kit was a bit uneven – I generally required a more solid blow than Devon did – but we’ll work that out, and I believe that all of the combatants felt “well-satisfied”. The Deed also had a second Deed with in! 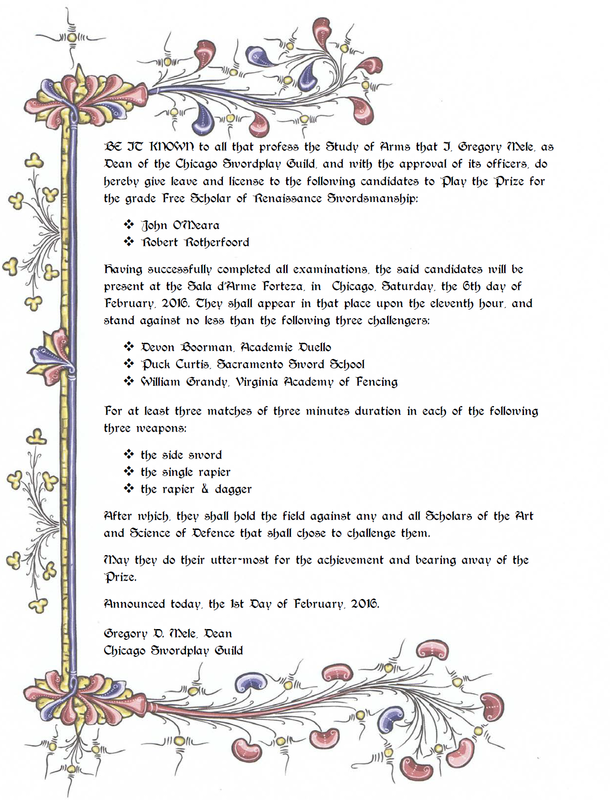 Last year, Bob Charrette, a founding member of the Seven Swords and a participant in all of the Deed we have hosted, asked if there might be a time and place to allow him to do a feat of arms in honor of his 60th birthday: to fight in harness for one minute for each year of his life. How could we possibly say no to that? So in between each bout, Bob met a challenger with their their choice of dagger, sword, axe, short spear and long spear. Bob fulfilled his Deed and could have stood a few challenges more (although I suspect he was content not to have to do so) – an inspiring model for all of us to emulate! At the end of the Deed, he awarded each person he fought with a token: a figurine of the Master of the Segno, carved by his own hand. 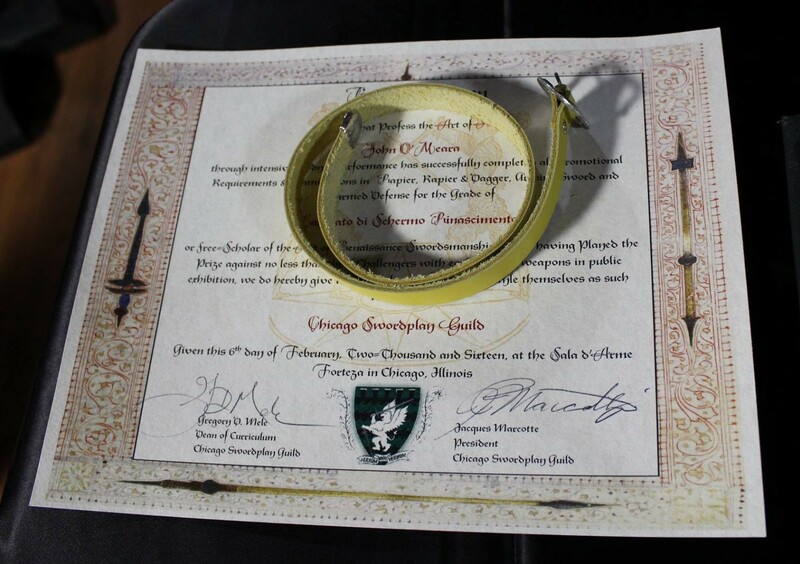 In turn, and to his great embarrassment, the Companions of the Seven Swords awarded him with a token of our own: a tournament sword in the style of Rene d’Anjou, made by Companion Scott Wilson of Darkwood Armoury, and inscribed with both Fiore’s four virtues and a crowned 60. A fine end, to a fine deed! The day could not have come to completion with the Dawn Stiers and her “squire team” who where indispensable in the running of the deed. Dawn is a master of organization who stepped in last year with my student Cooper Braun-Enos to whip the flow of the event into shape. This year, she and her crew made things move so smoothly that we finished half an hour early! A huge thanks to all of the team, especially Erin Fitzgerald, who was always on hand to help me with my armour, hand me water and make sure I knew where I was going and what I was doing. Welcome to the Party! A rogues gallery, courtesy of Ed Toton. Saturday night’s feast – an old-school pig roast – has become a tradition at WMAW. Every year we’ve had a different theme. One year was a costume party “celebrating 600 years of Western martial arts”, another year was medieval, and last year was Victorian, in keeping with the entertainment: a reconstruction of a 19th c Assault of Arms, such as might have been seen at the Bartitsu Club. This year was modern formal. Every year, Dr. Bill Ernoehazy, as master of ceremonies, takes on the persona of the theme and weaves that into his presentation style. But what do you do with modern formal? This was one of the cleanest and finest martial displays I have *ever* had the privilege to watch. It also revealed Roland and Jake’s alter-egos, as can also be seen from the photo at the bottom of this article….. 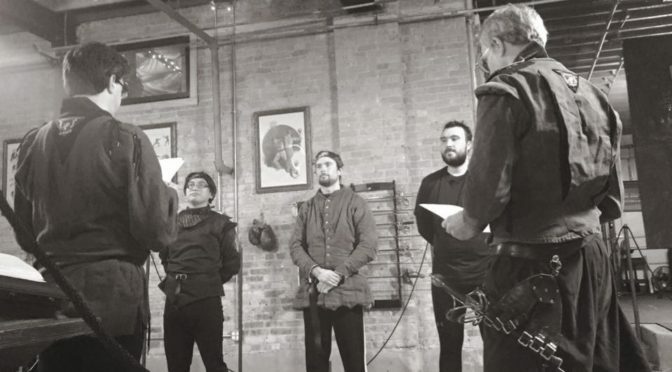 Standing in for both an injured Devon Boorman and John O’Meara, CSG’s Rob Rutherfoord met Bill Grandy in an Italian rapier bout that was, bar none, the most technically clean we’ve ever had, while also being quite athletic. I don’t think Rob needs to ever worry about being the “stand in” again! Finally, the Demo Bouts have always featured swords, but this year we also had knives. Roberto Laura opened the demonstration with one of the elegant solo forms of the Italian knife schools, and there was a bout with American Bowie knives; a spirited display by Keith Jennings (CSG) and Thayne Alexander (RMSG). I think next time we need to chalk their blades…. All-in-all it was a great night of food, fencing and merriment, and a great capstone to the event. Every event has its flaws. Although there were notable, and inspired exceptions (Jake Norwood and Keith Jennings, I am thinking of part two of your bout! ), the freeplay quality was lower this year than at last WMAW. But the decided downside was an increased number of injuries, particularly to thumbs and fingers. The two worst injuries were Sean Hayes’s little fingers, broken by a pollaxe during the armoured Deed of Arms, and Mishael Lopes Cordoza’s thumb, which we thought suffered a bad jam during the Challenge Tournament, but which in reality has a complex fracture (damn, damn and triple damn). Sean’s finger was broken in a pollaxe bout with a new pollaxe design. The weapon behaves really nicely – indeed, just like a pollaxe, which was the problem. The axe head was likely too narrow to distribute force, particularly against someone wearing finger gauntlets. Devon Boorman shoulder was injured during a throw, also during the Deed of Arms, which rendered him out of combat for the weekend and a lefty for teaching purposes for the next two days. At first I thought he might have dislocated the shoulder, but it proved to be just deep tissue bruising. There really isn’t one. Grappling is inherently dangerous, and in harness the higher center-of gravity and lack of sensitivity often takes both people to the ground. In reviewing video, no one really did anything wrong, nor was the throw particularly dangerous – one combatant simply landed hard on the other. This injury probably falls into the realm of “things will happen in full-contact sports”. Lopes’s thumb was broken at the middle joint during the first round of the Challenge Tournament. Of course, Lopes being Lopes, this in no way stopped him from fighting and winning the longsword finals, so I doubt most people realized how complete the fracture was until he got home and posted x-rays to Facebook. None of the combatants were wearing plate gauntlets, but what they *were* wearing varied from the custom gloves at Sparringglove.com, the cheap Absolute Force knock-offs and lacrosse gloves. There was no consistency in the swords used in the injuries, but they included an Atrim I-beam sword, a Regenyei feder, and an Albion Meyer. We discussed this a lot with the instructors who stayed afterwards at the event, and I don’t really have one, in part because I don’t think the injuries were because of a singular issue, but rather a “perfect storm” of a variety of issues. Swords – I can’t say anything for certain, but I will note that each of our last three events someone has gotten a part of their hand mashed by the Atrim I-beam swords. I love Gus, but I really think he’s recreated a crowbar, not a sword, with these weapons, and I think the use of this weapon in inter-group fencing and competition needs to be evaluated. Blow force – I will say that I saw people hitting harder and relying on far more safety gear than in previous years. This was particularly true of those who come from a tournament-focus. More gear, more force, and while higher level combatants were good at modulating their power, lower level fighters emulating them clearly were relying on the armour to get the job done. The end result was that I saw a lot of what was familiar from my SCA days – a reliance on safety gear over control, and a lot of *hitting* with swords, as opposed to cutting – with the same sorts of injuries. Safety-Gear: the problem clearly went beyond safety gear, but I do think that in some cases that exacerbated the problem. As I said in my review when the Absolute Force gloves came out, they do not have the shaping, dexterity or strength of the Fechtschule Gdansk gloves they knocked off. I particularly noted that the thumbs were flimsy, particularly at the joint, and the way they fold over the glove, instead of to tucking in (as seen in historical mitten gauntlets) made thumb injuries likely. I was told by the manufacturer “oh, everyone loves them”. Maybe so (although I think what they love is the price-point), but between WMAW and Armizare Academy I have now seen five significant thumb injuries to people wearing these gloves, and as blow force goes up, I suspect more will follow. If you have $120 hands, by all means wear $120 gloves, I guess. Style: All of the thumb injuries happened to people who practice German arts. I don’t think that is a critique of the style, but I do think that since it uses slipping in and out of the thumb grip, it is worth investigating how people are using that grip under adrenaline pressure, and with different sorts of hand protection, to determine if they are over extending or hyper-flexing their thumbs, making them more susceptible to being hit. Shameless Personal Editorial: When the debates over historical gear vs. non-historical gear went through the community, one complaint was that the gambeson, gauntlets and helmets that some of us favored were “too bulky and too heavy” for unarmoured combat. Indeed, that was the rationale behind many of the nylon swords, such as the Rawlings line. That argument may or may not be true, but the overall amount of kit that I saw the modernists wearing – full shin, knee and instep guards, full arm guards over an Axel Petterson jacket (a gambeson by any other name), reinforcing gear *under* the jacket, sometimes black, plastic reinforcing gear (shaped, I might add, like medieval armour) the arms of the jacket, compression pants with protective plates, and so forth, was astounding. It also actually weighs notably more (and in the case of the hand protection, clearly protects less) then what I was told was too heavy to simulate “unarmoured combat”. I think the virtue is it’s modern and black. In any case, I think too much armour + blunt swords comes to less fear of closing and more percussive use of the weapon, making it more like stick-fighting than swordfighting. YMMV. This was our most ambitious WMAW and I think our most successful; not just because the event was sold-out, but because attendees had a vast choice of activities, there was plenty of friendly blade-crossing, and I think the overall spirit and nature of the event was the most upbeat, warm and positive I have seen. WMAW was designed as a way to showcase research, try new things and build bridges, and I hope that was achieved with some of this year’s new faces. Of course the event only happens because of the tireless work of the WMAW event staff: Nicole Allen, John O’Meara, Jacques Marcotte and Christina Bailey, and the hair-pulling efforts at ride coordination and equipment transportation by Davis Vader, whose job I would not do at gun-point. Our staff’s efforts only get us to the day of the event; after that it is the legion of Blue Shirt volunteers and drivers who make us pull the event off. Thank you, each and every one. And thanks to all of the students who make this worth doing time and again. You can find additional WMAW reviews from Jake Norwood on the HEMA Alliance forum and a variety of instructors and attendees at the WMAW Facebook page. 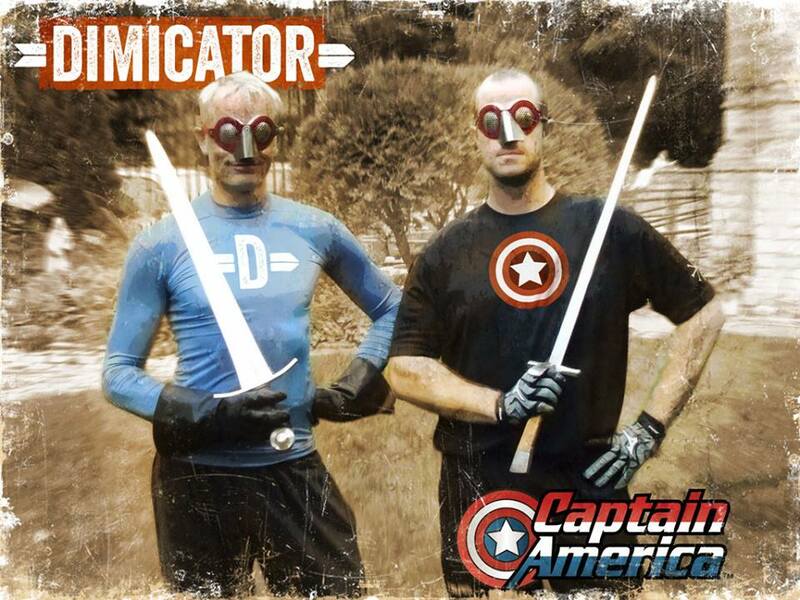 Here is a rare collector’s post card from the early days of HEMA superhero geekdom, showing the Dimicator and Captain America. At the time, critics were still holding out hope that the Dimicator would become a superhero. 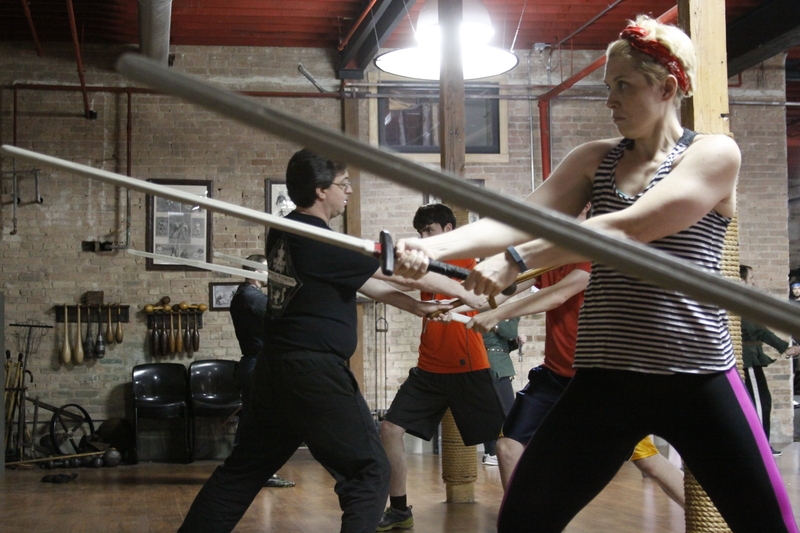 In the 14 years since the Chicago Swordplay Guild was founded, I’ve sought to keep martial arts politics off of its website, even when I’ve been in the thick of things myself. When we redesigned the website to include a blog, we’ve focused on event notifications, reviews, demos and training material. But the broo-ha-ha in the last two weeks over the creation of an Historical Fencing Master program by the United States Fencing Association (USFCA) is sadly killing that 14 year streak. It has long been my belief that to grow and flourish, the study of Historical European Martial Arts needs both greater professionalism and recognition from established organizations. Being an academic, I live in a world where credentials are very necessary. Many others have seen how such recognition would be beneficial to their own efforts. Now, before I say one more word – I personally think that while Ken’s role was a well-intentioned, but misguided effort, I don’t think the program was viable, I don’t think the USFCA were the people to do this, and I don’t think their motives are particularly pure. Further, at this point, the likelihood of anything good coming from it is probably somewhat less likely than using an alembic to turn lead into gold. He has been a student of French smallsword, Italian rapier and Italian longsword for nearly as long as he has fenced, trains and fights in armour and is learning to joust. He has organized and presented papers and sessions on HEMA at the premier medievalist conference in the United States. 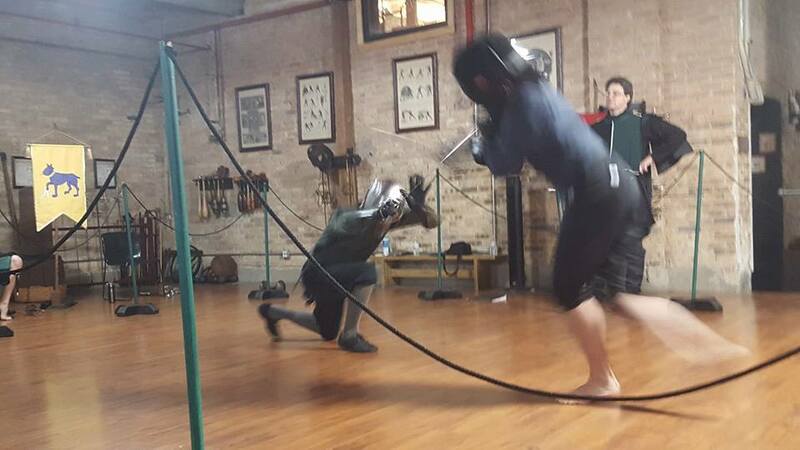 He has taught classes on applying classical fencing pedagogy and interpretive classes on rapier, smallsword and longsword at various HEMA events in the United States. Regardless of how it got there, now the program is live, and as the USFCA usually does things, they made a hash of it. Besides Ken, the other two members on the committee are not well-known in HEMA circles. One is Jerry Benson, a fencing coach of some reputation who has students deeply involved in HEMA practice – I do not know if he saw this as a way to work with his students to create something better or if they approached him, but he does not deserve to be called “Jerry the Salesman” because he had the gall to give a lecture on how to develop successful fencing programs; anyone who has to pay rent to keep a studio open for a large club, rather than train with four buddies in the park gets that reality. 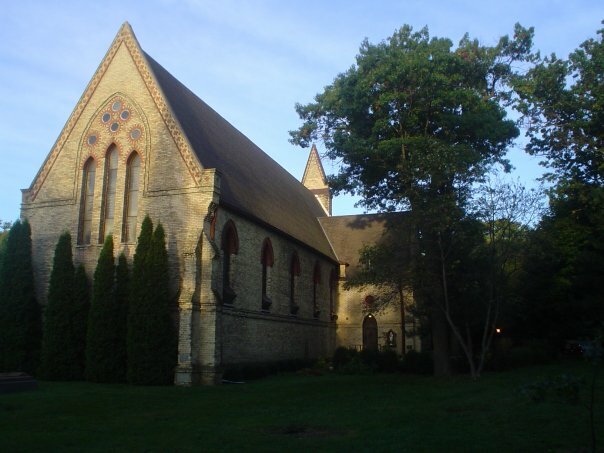 To have had any hope of legitimacy with the “community” they were hoping to attract, the program’s first candidates should have had to publicly go through all three certification stages themselves, publicly. Instead, the USFCA chose to promote the three members of the committee directly to Maitres des Escrimes Historiques, thereby giving them the authority to run the program. Their choice, but an incredibly stupid one. So in the end, Ken’s idea was laudable but dead-on-arrival in my opinion (I will explain why in a separate post) even before politics got involved, but once they emerged there was no hope whatsoever. And so we have the digital gnashing of teeth, the tearing of breasts, and the prophesized end of civilization as we know it, as legions of electric foil-wielding fencers line up in order of their tournment seeding to plug in their longswords and lead us down the brimstone path to martial arts hell…. While Jerry is now the traveling snake-oil peddler, Ken is the traitorous cuckoo in the nest, and apparently, all good Dead Fechtmeister-Fearing Men must roast him and tear his flesh, because he “was warned” – by no less than the Godfather of HEMA himself, who said “thou shalt have false Masters before Me “. He also vowed to never adopt such a title himself, which seems noble and bold, until you realize that as it is a teaching title, and he has neither a school nor students, that isn’t saying much. some of these same folks criticized myself and others when we revealed that Andrea Lupo, the founder of both the Federazione Italiana Scherma Antiqa e Storica (FISAS) and the International Master at Arms Federation (IMAF) was a fraud who had made up his entire martial pedigree, and most of his personal background, inventing the name of one master and claimed false credentials from another, because it was “no one’s business but the Italians” – even though Mr. Lupo had been trading on those credentials at seminars in the USA, Canada and UK as well. some of these same folks thought it was shameful and “bad for the art” to “publicly air dirty laundry” when it was revealed that the owner of the now-defunct Chivalry Bookshelf had defrauded his authors of their intellectual property and their royalties to the tune of tens of thousands of dollars, now see no problem in spending hours publicly ridiculing, personally attacking and mocking a man who never did them a lick of personal harm – and whom they never once tried to talk to privately. at the same time that they were lambasting the USFCA for appointing its first masters with a lack of transparency, some of them were instituting a certification program in which the first instructor was certified out of the public eye. Now, so as not to paint with too broad a brush, there are also legitimate concerns being raised with measured thought, polite language and an honest attempt to present the position without crucifying anyone. The best summary of this is Roger Norling’s blog post. If you’ve cared enough about this subject to read my post, you should read his for counterpoint. There are hosts of fencing coaches – modern fencing coaches – today who are not certified by the USFCA, and the USFCA has had no ability to prevent them doing what they do. Beyond the fear of a domino effect, the other problem is apparently using the tile of “Master”, probably the most over-discussed and over-valued word in our community. We know that this was a title used by trade guilds to mean someone qualified to teach his art to others, under his own auspices and no more. We even have the qualifications used in Germany, England, Spain and the New World, and frankly, at least the German qualifications to that vaunted titled are not all that impressive once you read them. Yet the idea persists that somehow the Master at Arms profession degenerated in the 18th and 19th century, whereas their 15th and 16th century counterparts were living engines of death and destruction. As such, certainly no one would ever use that term today…. Although he does not use it externally, Devon Boorman’s title with Academie Duello is Maestro d’Arme. Devon runs the largest HEMA school in the world, with a comprehensive curriculum, an weekly video lessons for students who are training alone or with one or two friends, and has traveled around the world teaching and fighting. Maestro Francesco Loda also was taught by Andrea Lupo, before going his own way, developing his own curriculum and heading the well-regarded Academia Romana d’Armi, which has since become affiliated with the Italian Fencing Federation (FIS). Maestro Loda is also apparently welcome at European historical fencing events. Maestro Massimo Malipiero was made a Magistro Re and Maestro di Scherma Antiqa by the Italian Accademia Nazionale di Scherma in 1999, as was Giovanni Rapisardi, and the program has gone one to create several other masters or submasters – “Magistri”. all of them can do in practice what they show in class, and research, fight and teach at a high level of effectiveness. IF A TREE FALLS IN A FOREST, AND YOU LIVE ON THE PLAINS, DOES IT REALLY MATTER? Unfortunately, global warming is real and will probably alter life on this planet radically in the next century. Fortunately, whether or not there is credible Historical European Martial Arts still on the planet when that happens will probably have less to do with the USFCA then it does climate change. You see, fencing in the USA is not governed by the USFCA, but by the United States Fencing Association (USFA) – the actual American branch of the Federation International Escrime (FIE). The USFCA can’t dictate what the USFA does and the two organizations don’t get along terribly well. OK, I am being kind: remember I said that the USFCA was toothless and neutered? Well, most sport fencers who are even aware that it exists consider it something of a joke. On the other hand, the Accademia Nazionale di Scherma is the Italian equivalent to the Coache’s Association and much more closely aligned with the Federazione Italiana Scherma (FIS)which is the Italian USFA equivalent. No, they aren’t going to follow the USFCA’s lead and create an historical fencing program, because they already have a Maestro di Scherma Antiqa program, with multiple ranks – founded under Giovanni Rapisardi and Massimo Malipiero in the 1990s. And just like the USFCA program, you pay for certification and certification training, with set course books and specific required reading, which just happen to be editions of the core texts (Fiore, Marozzo, Capoferro, Scorza e Grisetti and Parise) created by Rapisardi and Malipiero. The first Maestro rank was granted in 1999 and I lived through the hue and cry. “Oh no, the Naples Fencing Academy is now licensing historical fencing, and they are part of the FIE – this is the end of historical martial arts in Italy. Then France will follow, and Germany, and …”. I would point out that somehow the Accademia Nazionale now also licenses kendo in Italy, so if anyone was going to make a power grab, this would have been the guys to do it. And yet, fourteen years later,while there are probably far more people licensed by FIS’s historical fencing program then the USFCA will ever see, FIS isn’t even close to owning historical fencing in Italy. 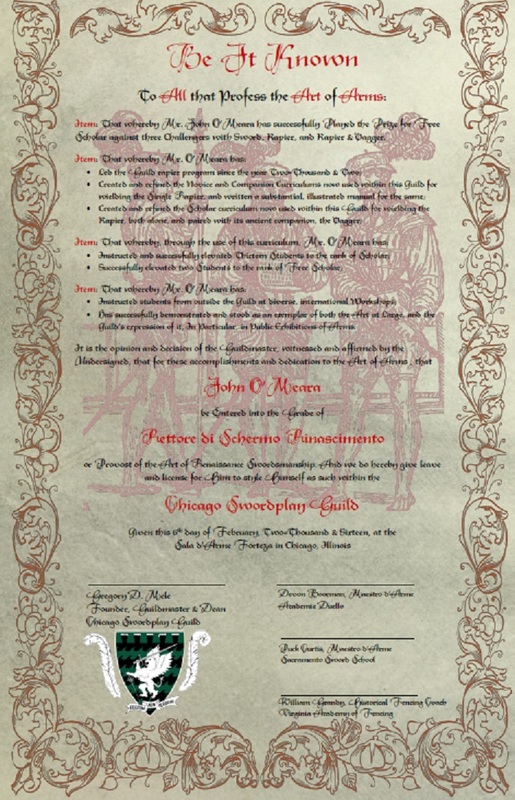 Sala d’Arme Achille Marozzo is clearly larger, so is Nova Scrimia, and ironically, so is FISAS – an organization founded by Andrea Lupo – the man who made up a mythical master and his entire martial arts biography, which is far beyond any of Walter Green’s mail-in certificates. Where’s the outrage? There is none, because a) this all happened 15 years ago, when most of those so upset didn’t know about HEMA and b) it has had zero influence on anything – HEMA has grown vigorously and in a variety of directions, including in Italy itself. In fact, some of the folks in Europe most terrified and outraged by the USFCA program on Facebook have those FIS salles listed on their “likes” page. I, Fiore, know how to read, write and draw, and have books on our subject, a subject that I have studied for over forty years. Yet, I don’t consider myself to be a perfect Master of it, although I am held to be such by some of the great lords whom I taught. Let me just say that if I had spent the same forty years studying law, jurisprudence or medicine as assiduously as I have studied the art of arms, I would be a Doctor in each of these three disciplines. And I have undergone great pain, labor and expenses in being a good student. That’s the most I can do, and accept that the path to mastering an art is just that – a path – that was never mean to end with a title, merely acknowledge that you could initiate others on that journey. First, it has been my hope that the USFCA certification could establish both an impartial credential and an invitation into a collegial community outside the politics and divisions that so plague HEMA. The last two weeks have just shown him what a charming delusion that was. Guy Windsor’s blog discusses both the controversy and why the program was flawed from the onset. In an effort to create something good out of the madness, Jens Kligman has created the Marxbruder Facebook group to humorously – and yet seriously – discuss the old German fencing guild, its testing requirements and to debate how the Guild could be recreated in the modern day. As the lightning rod for the debate, Ken Mondschein has tried to explain his position in an open letter. While most of the debate has swirled about Facebook and other social media, as I said Roger Norling has tried to present the other side’s arguments sans diatribe or personal attack on his blog. He and I agree about the program’s flaws, not the threat it represents, but his positions are worth reading and considering. Answer: Sometimes you just say it. My last post was about the hullabaloo regarding the recently instituted Historical Fencing certification program being developed and promulgated by the United States Fencing Coaches’ Association (USFCA). 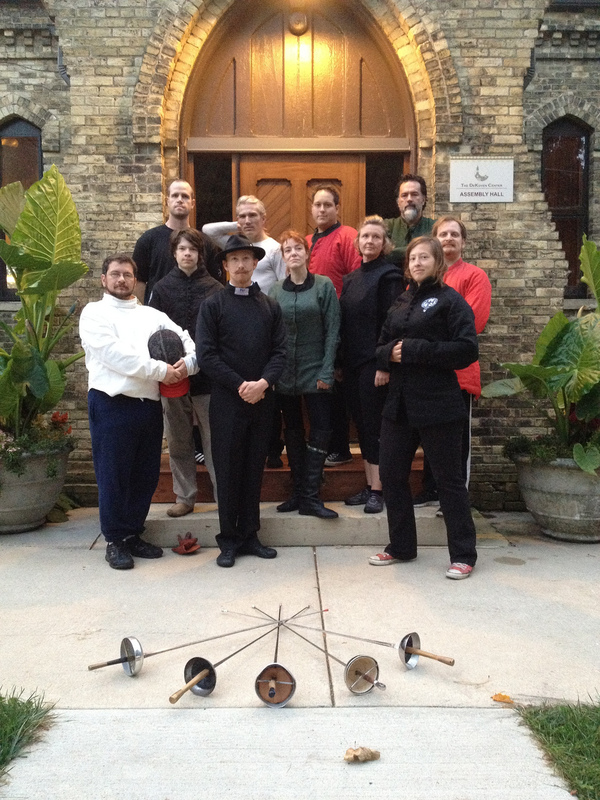 I focused on a need to separate the character assassination of the members involved from a critique of the program itself (as was also done in counter-point here), and to express why I disagree with the idea that the program is a “threat” to other folks studying and teaching HEMA in the USA. Ken knows I don’t like the program, and he knows I don’t support it, so that wasn’t a surprise, although probably a disappointment. I didn’t expect that just a few hours after posting, I’d be getting a ton of private emails about why I think the USFCA program is a non-starter, but fortunately, I was already preparing a post to explain just that. Add a little insomnia and you get your follow-on post. 1. I don’t Believe in Generic Certifications. 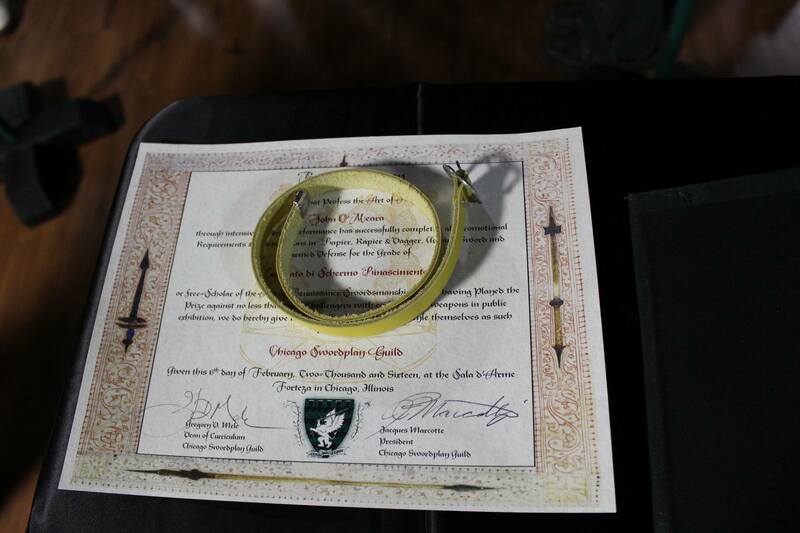 Creating a Master of Historical Swordsmanship license is like creating a Master of Kali or a Master of Kenjutsu license. Which tradition of those arts? Under whose authority? With what weapons? But in some ways it is even worse, as Western arts cover centuries of development and innovation in which not only the weapons, but the culture, mindset and combat context radically changed. Yes, duels were fought in the 15th century and the 18th, but they were fought with radically different tools, radically different rules, and often for radically different objectives. Mastery of one weapon does not convey mastery of the other, before we even begin to discuss the particulars of tradition. Further, when we do move into the realm of pedagogy, we still have some problems. 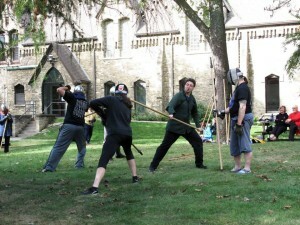 Although we can argue that at a very real level an attack is an attack, a parry-riposte is a parry-riposte, etc., that does not mean that the tactics of those techniques are the same, era to era or tradition to tradition. The French tradition, from which modern fencing primarily derives, for example, favored the parry-ripsote as the foundation of good fencing, while the contemporary tradition continued to make stronger use of counterattacks, as had been used with the old rapier. Take a walk backwards four centuries and cross into Germany and you have five key blows, the so called Meisterhau, of which at least four are indisputably counterattacks and a teaching paradigm that builds on what happens when the opposition has been successful, but the attack did not land. Nevertheless, the intention is to immediately take the initiative with an action in-tempo, forcing the attacker onto defense. Is such a thing unknown in modern fencing? No, of course not! But it is given different priority. Change the emphasis and you change the art. Simply put, just because it is a sword doesn’t mean it is used the same way every other sword is, or even the exact same way that the same sword is used in every tradition. The devil is in the details, and saying that “using a longsword is using a longsword” is like saying that using a katana is using a katana, and since it and a longsword are both two-handed swords, they must be precisely alike it is only true at the broadest level. 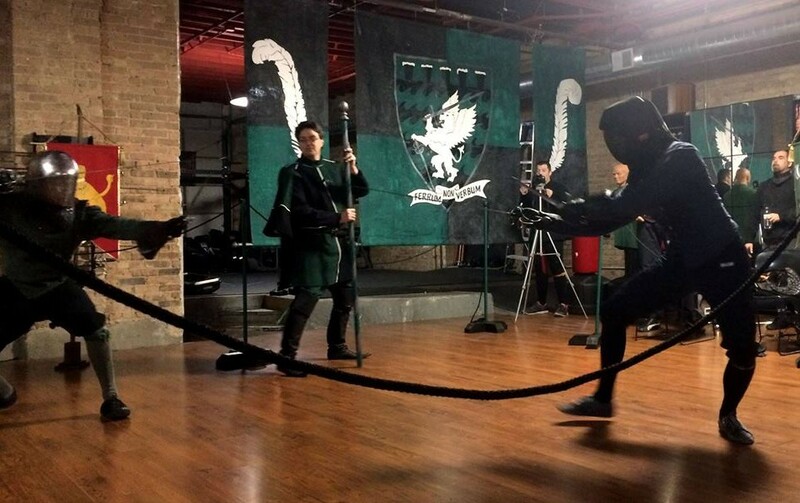 Now, there is an obvious work around to this – a USFCA “generic” historical longsword, rapier, etc curriculum, meant to be used as a modern lingua franca for students. Honestly, if I have to explain why that is a phenomenally bad idea, or why it directly plays into the concerns of the programs harshest critics, you can probably stop reading this post now – we’re talkin’ different languages. But try this: find a nice old-school Kyukushin Karate dojo and ask them what they would think of a pan-karate teaching certification, that included not only Okinawan Karate of all styles, but Japanese styles and Tae Kwon Do (which originally derives from Karate). If you are worried about getting kicked in the head for your troubles, try it with something safe like Aikido or Tai Chi and just suggest the certification apply equally to all flavors of that one art. I will let those who study 18th c backsword, broadsword, smallsword and sabre determine how well a coaching program for Olympic fencing can be applied to their arts, which are the direct antecedents of classical fencing, which in turn is the antecedent of the modern sport, and speak to the arts I study. Simply put, although the famed Lugi Barbasetti was correct when he compared the martial art of Fiore dei Liberi to “Japanese wrestling or Roman pancration”, his inability to also recognize the relationship of those arts to fencing speaks directly to our point. Barbasetti was a true fencing master, learning and teaching in an era where the sword was still being used in the duel, in highly-watched, high-stakes exhibitions, and occasionally, on the battlefield. Even so, he could see little in pre-rapier fencing that was fencing and not just wrestling and bashing – something with which he had no experience. Now imagine his modern descendents, trained to view fencing as an Olympic sport, fought for points, assessing the longsword – a weapon used with extensive disarms, grapples and hilt-strikes, all built around a foundation in grappling and dagger-combat. How can the USFCA possibly ascertain the quality of that wrestling or its instruction? How can they assess it for being taught safely? Short answer – they can’t; it is well beyond their skill set. 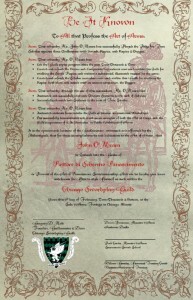 So any certification for a Maitres des Escrime Historique would need to either a) be done in conjunction with a second organization, such as one of the state Collegiate Wrestling associations or b) restrain itself to looking at only simple wrestling techniques made at or on the blade, such as hilt grabs, disarms and envelopments of the blade with the arm. Of course, the former solution won’t happen – it was probably hard enough to engage one Olympic/collegiate sports association, good luck engaging a coordinated program with a second, especially when they are currently more focused on not being phased out of the Olympics, not to mention an increasing number of American high schools. That leaves the second option; just keep the wrestling to actions done against the blade. Problem is, the moment you do that, you just neutered the “H” in your Historical European Martial Arts (granted, large parts of the modern HEMA “community” do that, too, but that is another can of worms). So we already have a major disconnect before we ever consider that, prior to the 1650s, there was an assumption that a swordsman would be well-versed with not only the sword, but the dagger, basic unarmed defense and possibly a polearm or two. Meanwhile, before the 1550s, the art was incomplete without at least a working knowledge of the sword, dagger, wrestling, some form of staff weapon and armoured combat – all of which are well beyond the USFCA’s expertise or qualifications to judge. You simply can’t study 15th c swordsmanship and understand it at a teaching level without include wrestling, dagger, polearms and at least some understanding of armoured combat. Likewise, you can’t study 16th c German martial arts and ignore the staff, dussack or messer or rappir, or train in Bolognese fencing without moving beyond sword and buckler. That is not how the arts were designed and not how they were meant to be understood or taught. Put another way, you can study whatever you want, but you can’t master these arts without doing that and you certainly can’t certify someone to teach it. This sounds brilliant – the guys who care about the art are certifying the people teaching the art! Woo-hoo, we’ve done it! Too bad in reality you are right back to the problem of point one, only now, with potentially a new problem: the self-trained certifying the untrained in arts they know nothing about. This falls under a fallacy of “I know good teaching when I see it”, which is true on the surface, but the problem is, good at teaching of what? And that is the next place where any pan-tradition certification goes directly to hell, minus its handbasket. 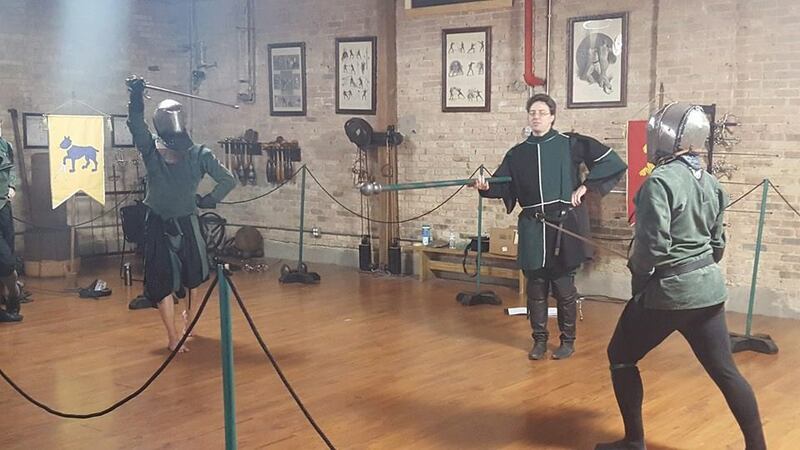 Example One: contrary to what everyone things, the Italian rapier really did grow out of classical Italian fencing. Now, add the community’s love with Capoferro, a man with pretty pictures but in want of a pedagogy, lesson plan or frankly, anything resembling coherence, and if you are trained in the Italian tradition, how hard is it to swap out swords, work in a few of Capoferro’s plates to your epee curriculum, adapt for the heavier sword and – voila! – Italian rapier ala Capoferro! Example Two: there are many similarities between the German Messer and Filipino Kali, how hard is it for a kali instructor to repackage his art with the German guards and terminology, drop the double stick or stick/knife work and convince a board of English backsworders, Bolognese sword and buckler fighters and Spanish rapier students that what he is doing is “authentic German Messer *as I interpret it*”? Seeing as I have seen both of these very things done, the answer is: not very hard at all. After all, the instructor moves well, runs a class well, has good mechanics and seems to know what he’s talking about. Plus, he’s your buddy, who’s a loyal part of your federation, has helped it grow and well, you don’t really know that much about that art, and everyone seems to think it is accurate, and he’s very good at it, so maybe you are just being pedantic…. At least it will probably be good martial arts; I have also seen charismatic, dynamic and physically gifted instructors give presentations in armizare that fly in the face of not only the direct words of Fiore dei Liberi himself, but immediately fail against a non-compliant partner. So, we have a good teacher, teaching, as the renowned founder of Ameri-Do-Te might say: Bullsh!t!!!! So the USFCA program fails my particular sniff-test on all three points. Like the dubious *cough, cough* IMAF program before it, it places importance in the sword in isolation and across the centuries, creating some sort of curriculum in which one learns “longsword” or “rapier” and so forth, at least as a moniteur. Since we know that the top rank is Maitres des Armes Historiques, not period specific, not tradition specific, we can only assume that the later degrees will follow the modern fencing weapon and just add weapons. So perhaps longsword and rapier for provost, and Lord knows what for master. 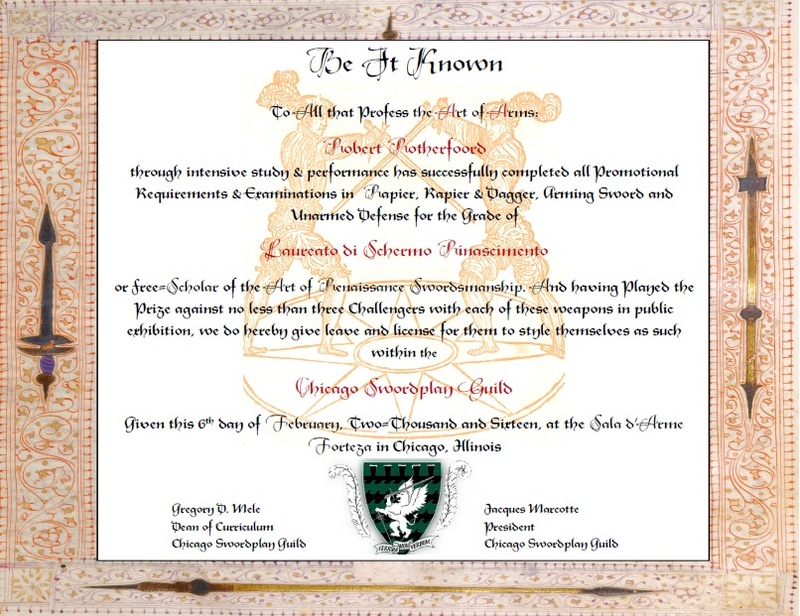 Even where this not true, no one in the USFCA, or in the masters they have appointed to oversee the program, have the depth of knowledge in one tradition to certify in a single tradition, nor the experience in close-quarter combat or polearms to create any credible “Master” of early English, Italian or German martial arts. COULD THIS IDEA HAVE WORKED? 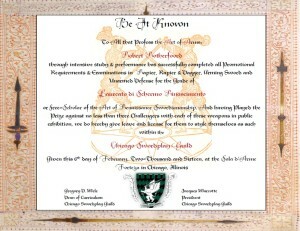 Where such a program could have had merit for those looking to refine their teaching would have been to simply run workshops for now on how to apply modern fencing pedagogy, sports coaching and training to historical swordsmanship – which is essentially what the upcoming Moniteur d’Escrime Historique clinics purport to do. Problem is, these clinics, supposedly designed to “prepare fencing coaches interested in taking the historical moniteur examination of the United States Fencing Coaches Association” are two-day workshops. You take several of these and then take your test. I guess if this was just to be approved as a teacher, that might be OK (OK, I am not convinced at all, but I am trying to be open-minded – work with me), but seeing as a number of the people coming in the door may have zero to no training in the art, what exactly are they learning? How can you teach what you do not already know? And if the program is non-denominational, how could the USFCA possibly provide pre-instructor training. WHAT SHOULD A CERTIFICATION PROGRAM INCLUDE? Well, that is the 10 million florin question, isn’t it? (Don’t worry, I was being currency non-denominational: florins were used as a standard measure of currency in various parts of Europe throughout the 14th – 16th centuries.) By now, you probably know that I just love lists, so here is one more. I have some knowledge of English and German martial arts, but I have spent most of the last 15 years with me head buried in 14th – early 16th century Italian traditions. That is what I know. I have no business telling someone how to certify a master of English martial arts or Spanish Destreza, nor do they have any business telling me what makes “good Armizare”. In short, any certification, to have any real intellectual and traditional legitimacy need to be “by xyz tradition, for xyz tradition”. As I said in my last post, we have the details for a number of different fencing guilds from multiple countries, the weapons they required, the number of grades, the amount of time spent in each and in some cases, the specific curriculum of what a provost or master was expected to know. It seems to me that if our goal is HISTORICAL European Martial Arts, then our model must begin and be deeply rooted in those models are we’ve already fallen off the map. By all means, let’s make good use of modern sports psychology and methodology, knowledge of kinesiology and so forth, but in the end, you want to study Old School, then you need to test Old School. I am not talking about weapons types, but rather diversity in instructor skills. Being good at hitting someone in the head is a great skill for a swordsman, only one of several skills for a good swordsmanship instructor. Even so, while good instructors are not always the best fighters, they must be good fighters. They need to be able to teach, to develop lesson plans, and to adjust to different types of classes and different types of students. But they also need to be scholars, possessing a strong knowledge of the source material and fidelity to it, with enough scholarly ability to research on their own and refine their own understanding of the art. Whatever standards a group establishes, whether that is internal to their school, across schools or within an accrediting body of some sort, their requirements should be clearly detailed, easily explained, verifiable by the stated source-material, and without mysterious “backroom promotions”. The idea of combined public and private examinations, public contests of arms and approval by a committee, rather than a simple “laying on of hands” by one’s Master has been the way Western instructors at arms have been made for at least 600 years – it is supposed to be the part of the tradition that modern fencing bodies have diligently maintained. In any case, the best path to legitimacy is through a high quality of work, and an open and transparent process, whatever that process might be. This is just a general outline of what I would consider the four foundation stones for building any certification program; they are what I have tried to use internal to the CSG, but they are also what I would encourage folks to look to more globally, much as is going on with Jens Kleinau’s Marxbruder thought exercise. Whatever the case, the respect any certification program garners, and how much its coin will be worth, can only be measured by the quality of the product it produces. Right now the USFCA program has created its de facto board to mint its own coins, we’ll see what comes out of it, but the metal seems fairly debased, no matter how good the intentions of those involved.